Less than five hours before the Florida International University pedestrian bridge collapsed, the project's engineers dismissed concerns about cracking in the concrete, assured colleagues it was safe to keep the road below open and said temporary shoring to hold up the span was not necessary as repairs proceeded, according to court records and argument during a hearing Wednesday in the civil lawsuits resulting from the collapse. In pleadings and in court, lawyers made reference to the minutes documenting what was said during a two-hour meeting held on site the morning of March 15, 2018. At 8 a.m., the engineers working for the span's designer, FIGG Bridge Engineers, climbed onto the bridge deck and examined cracks that had formed and were growing on the north end of what was to be FIU's signature project. An hour later, FIGG headed a meeting about the cracks and its plan to repair the bridge for a group of engineers from FIU, the general contractor MCM, the Florida Department of Transportation and an engineering firm hired by FIU to oversee engineering and inspection. FIGG gave a PowerPoint presentation and assured the others present that its calculations confirmed "there is not any concern with the safety of the span suspended over the road," according to meeting minutes cited in the court pleadings filed in response to FIGG's efforts to keep confidential drafts of its take of what was said at the meeting. When the issue of whether temporary shoring should be brought in to reinforce the bridge during repair efforts, FIGG said it "was not necessary," court records state. 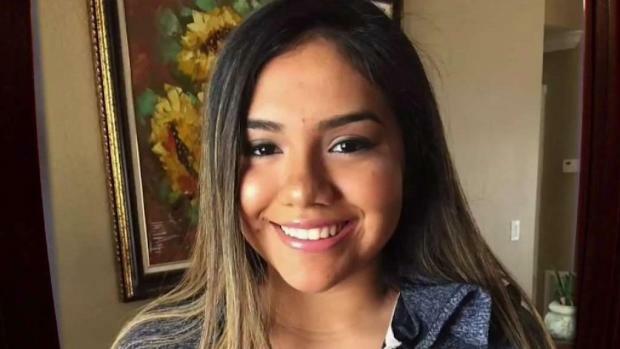 "Based on conservative calculation," FIGG concluded, there is "no safety concern," the PowerPoint stated, according to the court filing. 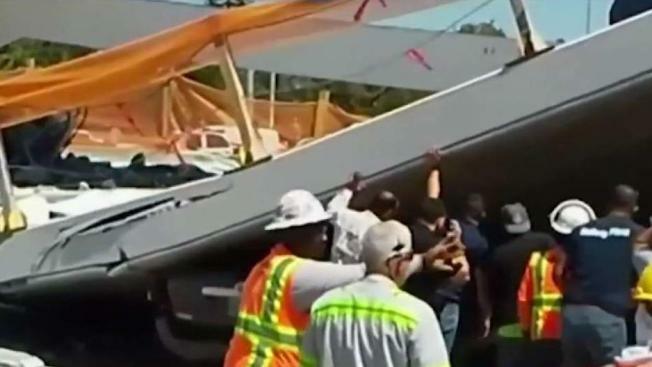 At 1:47 p.m., as a subcontractor was carrying out FIGG's orders relayed through MCM to increase tension in a truss that was cracking, 950 tons of concrete fell to SW Eighth Street, killing five people in vehicles and a worker who was atop the bridge canopy. 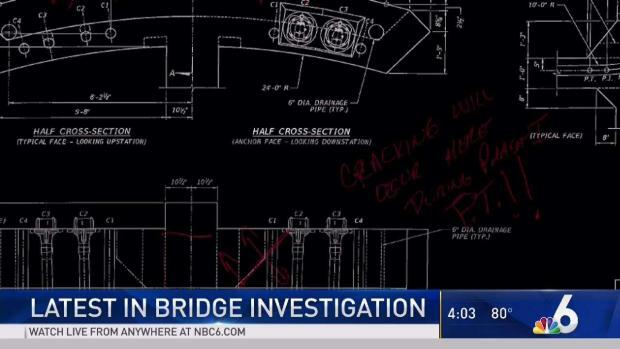 The previously sealed court pleadings, obtained Wednesday by the NBC 6 Investigators, reveal that three days before the collapse, the project's general contractor, MCM, reported to FIGG "significant and worsening cracking of the bridge. "It is our opinion that some of the cracks are rather large and/or of concern," MCM told FIGG, which was then asked, "if there is a required course of action to remedy or address the right away." The next morning, March 13, FIGG's president, Linda Figg got involved, emailing her engineer of record on the project, Denny Pate: "Wouldn't it have made sense for us to address all of these things while we were on site? … I think it is important for you to stop whatever you are doing and address this so we can put all of these items to rest quickly." Later that day, Pate informed the FDOT of the cracking, while his supervisor emailed MCM, saying "FIGG is evaluating this situation as a top priority … As of right now, we do not see this as a safety issue," according to filings in the personal injury and wrongful death cases filed against two dozen companies involved in the project. By then, FIGG's engineers had decided it would order the tightening of steel bars running through the cracking truss. It was the first step of "a repair method" it devised to shift stresses away from the area where the diagonal truss being tightened met the bridge deck – a process that was to be implemented by about two days later, according to the minutes cited in the court filing. At the March 15 meeting, a participant from Bolton Perez & Associates (BP&A), the company hired by FIU to oversee construction engineering and inspection, asked FIGG whether its repair plan had been reviewed by peers in the engineering field. BP&A said it "wanted more eyes on this and the more eyes on this, the better," according to the minutes. FIGG indicated it had not, the court records say. But FIGG has challenged the accuracy of the minutes of the meeting, prepared by BP&A, and six weeks after the collapse provided its own version of the meeting to the National Transportation Safety Board, calling them "corrected minutes." 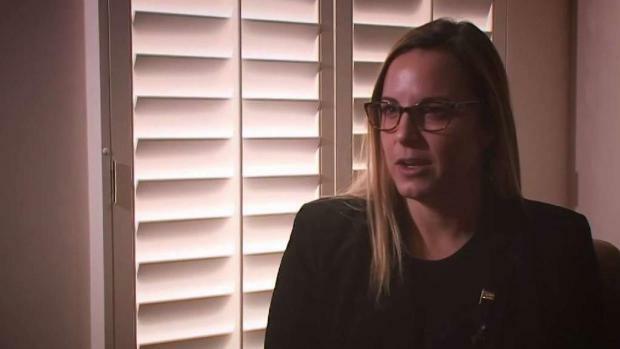 FIGG's version made "significant substantive changes" from the original minutes, according to a lawyer for The Louis Berger Group, an engineering firm also being sued in the civil cases. It was hired in 2016 to do an independent peer review of FIGG's work, which it certified in February 2017. Neither version of minutes has been made public in their entirety, as the NTSB has put a blackout on almost all public information about the collapse. • whether FIGG's repair plan had been reviewed by peers. Attorneys for both Louis Berger and FIGG declined to comment on what was said in court or in their pleadings.